RT Graffito - impressive template from the team RocketTheme, designed for functional platform 4 Gantry Framework, which includes an enhanced user interface. An updated version of the framework uses fewer CSS files using a dynamic language styles. 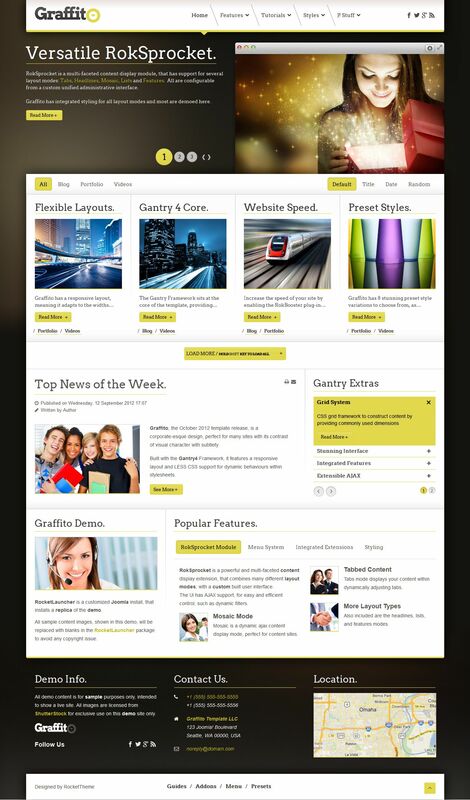 Layout template is designed with all the modern requirements and fully supports any mobile devices. This template comes with a development studio RokSprocket, which now supports the touch of your fingers when displayed on tablet devices and provides easy viewing of materials. Also represented in the template support popular component K2 with additional styles, appropriate design template.